IT IS IN VERY GOOD WORKING CONDITION! EVERYTHING WORKS FINE! THERE ARE FEW MINOR “SCUFF MARKS” AND ONE KEY HAS A SMALL CHIP (PLEASE SEE THE PICTURES! 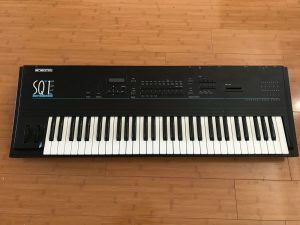 “Ensoniq SQ-1 Synth with case. Perfect condition. WITH additional SC-2 ROM card for 160 additional sounds on top of what comes installed with the keyboard. “The SQ1 came out in around 1990. It is technically a digital synth, but many of the modulators and filters are analog making this one of the fattest sounding digital synthes from this era. I bought it about a year ago on ebay on impulse, I had owned an ESQ80 and was wanting to recreate some of the sounds I had. The SQ1 plus did a great job. But outside of getting the sounds I wanted, I’m a guitar player and now the band isn’t playing the songs it was used for. So time for it to find a new home! “For sale is a near-mint condition Ensoniq SQ1 synthesizer. It has some minor cosmetic scratches on the surface. It also will need a battery at some point (battery low condition). All keys and buttons were functional when I played it. “This is Ensoinq SQ1 plus music studio production,which shows some kind of Error on the LCD screen is for parts or repair.When I power the keyboard on,the displays says Unexpected Event,then after a minute Or two minutes the screen shows all the sounds name and prameters,but the sound is distorded.I am not sure what is wrong with the unit.All the bottons,switches,sliders and the keys for perfectly.The unit does not come with the power cord.The keyboard will be sold as is,with no return. ” Auction ended. Click here to browse on eBay. great sounding synth” Auction ended. Click here to browse on eBay. “Der Synthesizer ist in einwandfreien Zustand, alle Regler und alle Tasten funktionieren.Das Gerät ist ein komplettes Soundstudio.Von Drums,Bass bis zu Leads ist alles im Gerät enthalten.Der eingebaute Sequencer ist einer der besten auf dem Markt und die super Effekte setzen den Sound die Krone auf.” Auction ended. Click here to browse on eBay. “Versteigere einen Synthesizer ENSONIQ SQ 1. Zustand gebraucht, leichte Spuren, alle Anschlüsse ok, Datum 07-13-1990 der Produktion. Papiere sind vorhanden. Auf wunsch sind Städer mit dabei. Der versand der Ständer erfolgt getrennt vom Syntesizer, es enstehen extra Versandgebühren.” Auction ended. Click here to browse on eBay. “Ich versteigere einen Ensoniq SQ-1 in sehr gutem Zustand. Die interne Batterie wurde bei Musik Jellinghaus ausgetauscht deshalb Reset auf die Werkspresets. Der Preis bezieht sich nur auf den Synth, das auf dem 2. Foto abgebildete Case ist in den Versandkosten enthalten oder kann bei Sebstabholung für 50€ erworben werden. Über das Gerät ist viel geschrieben worden, im Internet finden sich etliche Artikel, Testberichte, Beschreibungen und Filmchen. Der Sound ist einzigartig und hat einen hohen Wiedererkennungswert.” Auction ended. Click here to browse on eBay. “Up for auction is my Ensoniq SQ1 Plus keyboard. It’s a synth and a sequencer (8 tracks). Tons of sounds plus it comes with another Ensoniq sound card with an additional 200 sounds. I am the original owner. It’s in good shape for it’s age. All the keys and buttons work. It comes with the A/C cord, the manual and the foot pedal. Only reason I am selling it is because I went with a Roland guitar synth. ” Auction ended. Click here to browse on eBay. ” Classic vintage synthesizer with original leads and original manual from 1991. Still works fine. ” Auction ended. Click here to browse on eBay. 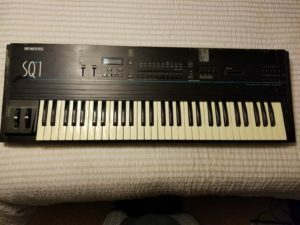 “Selling my trusted Ensoniq SQ1 Plus keyboard. I rarely ever use it anymore because I’ve gone to plug ins for most of my recording needs. This unit is in excellent shape with no scratches and all the keys are perfect. I have the original manual and will include it. The unit works and I had the better compartment altered by a professional to make changing out the battery every few years easy and much less expensive. I tested the keyboard today and all the sounds work and sound great. The battery is a few years old and suggest the new owner change it out soon.” Auction ended. Click here to browse on eBay. “This is amazing. Still a sought after unit among seasoned pro’s! Great condition. Works perfectly! Some cosmetic blemishes none of which affect functionality! Below are a few specs and pics. Don’t miss it! Thanks!” Auction ended. Click here to browse on eBay. “This is a wonderful keyboard that has lived in a smoke free home. It works great and sounds awesome!” Auction ended. Click here to browse on eBay. “For sale is a used Ensoniq SQ-1 Synth. In great condition and fully functional. Vintage and rare item on ebay, it’s the only one listed! Awesome library and clean sound, one of the best synths back in it’s day. Will also include stand seen in pics for FREE!! COMPLETE PACKAGE!” Auction ended. Click here to browse on eBay.